The Iranian poet Hafez (Khwaja Shamsu d-Din Muhammad Hafez-e Shirazi) lived in Shiraz between 1315 and 1390. He is one of the most significant and admired poets of Iran, whose poems are well known to all Iranians. 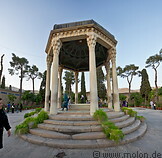 The tomb of Hafez (Aramgah-e Hafez) is surrounded by gardens and lies north of the seasonal river which crosses Shiraz. 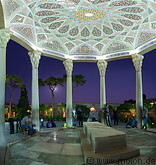 It consists of a pavilion which covers a marble tombstone engraved with a verse of Hafez and the Hafezieh, a memorial hall, all set up in a well kept garden complex. The current structure dates back to the year 1935.